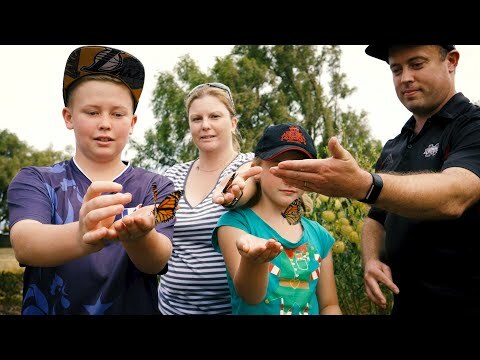 Apollo Park which lies in the heart of Milson is also commonly known as Butterfly Park. It has a large playground, and gardens which help our native butterflies thrive. Apollo Park was set aside as a reserve in 1972. The planning and subdivision of this part of Milson took place in the 1960s when NASA astronauts walked on the moon during the Apollo programme. Surrounding the park are 11 street names which all reference the space programme or solar system. The playground, which was renovated in 2018, features a large rocket which children can climb in and on and be spun. The sign welcoming people to the park is exactly 110 metres to the butterfly area of the park. The 110-metre distance was chosen as that is the length of the Saturn V Rocket - the shuttle that took the astronauts to walk on the moon. Apollo Park is often nicknamed Butterfly Park. That’s because, in 2012, a huge community effort transformed part of the park into a sanctuary for our native butterflies. Paul Vandenberg came up with the idea after witnessing hundreds of monarch butterflies in the park’s willow trees. He discovered that they hibernate in the park over winter before hatching in spring/summer. Most of the plants have been chosen for their ability to attract butterflies and to provide food for caterpillars. The best time to visit the park to see the butterflies is from December to April in the early morning. You might be able to spot Monarchs, Red and Yellow Admirals, NZ Coppers and Little Blies. The playground was upgraded in 2018. Exploring butterfly garden, play and picnics. Upgraded playground, airtime basketball hoop, picnic tables made of recycled plastic.